Need to buy a present for a young person who owns every single consumer item known to mankind? Scott holds an Australian Financial Services License (AFSL) so he knows what he’s talking about and he’s regularly invited to spread his “5 Step Barefoot Investor” message at corporate keynotes, schools, indigenous programs and prisons throughout the country. Instead of working in the finance industry as a broker/banker/financial advisor he’s decided to make a living helping young people notoriously uninterested in financial matters understand the complex and often bewildering world of money management. Scott is well regarded by the finance industry and media, regularly giving impartial financial tips on Australian Radio (Triple M, ABC Radio) & TV (“The Nest” on SBS ) as well as in his newspaper column. Sir Richard Branson probably said it best when he stated, ‘The Barefoot Investor makes finance fun’. It is Scott’s unique ability to combine his knowledge, experience and infectious humour to achieve what most people thought was impossible – to carve a niche in the financial market targeted at younger generations. The main strength of Scott’s book is that as a young person himself, he understands the behaviour of young people driven to compete with friends to buy expensive cars, clothes, gadgets and spend big at pubs, clubs and bars partying several nights a week with reckless abandon. 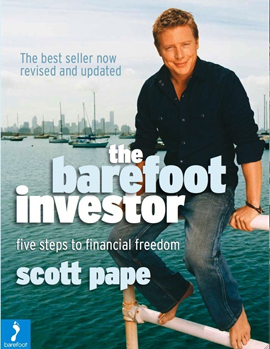 Australian readers can WIN a signed copy of Scott’s Book “The Barefoot Investor: 5 Steps to Financial Freedom” by adding a comment at the bottom of this review explaining why his advice would help you (the book has already been given away). I have been subscribing to Scott’s Column in the Yahoo website for a while. His posts are so fun to read. Great to see you covering some of Scott’s latest work! I have spoken with him a few times via email and read his writing on different news sites over the years, he is such an easy going writer and really does explain things in a simple way. 1. I enjoy his writing style, it is easy to understand and gives great practical advice for young investors like myself who want to get a better understanding of how to manage your everday finances. 2. I run a website about Saving Money and would love to be able to quote Scott occasionally when giving advice and tips on money. 3.The concept of financial freedom is something that is heavily on my mind, I am constantly trying to understand ways to use my money in a smart way to not only further my net worth in the future, but to ensure my family will also have the same principles of money management as I do. I think this book would be a great way to learn some new ideas to help this point. Neerav – Have you read this latest book? What are your thoughts on it regarding helping someone manage money? I hear a lot about compound interest being a great thing to do with my money. Where do I find these amazing accounts. My bank just looks at me like Im talking another language and offers me term deposits. I am just an average person without much extra cash but most of the investments that look like they may be compound roll over need a large starting amount & then at least $500 in every month. Is there anything out there for the average low income earner like me?? i hear compound intereest is a great idea but which bank will allow me to boost up my bank account? which bank do you reccommend has the highest interest rates? Read his article on interest rates in the Sunday Times 29th Mar 09, so I looked him up on the net & would like to show his book to my son who has just started his Apprenticeship. I’m approaching 60 and full-time work because the youngest of 5 children I’ve raised on my own turns 16 in a couple of weeks, meaning I lose my Centrelink supplement to my part-time income. I love Scott’s column in our local Mercury. As he so wisely says in today’s column, my most valuable commodity is slipping away, none of us gets out of here alive. I’d love to be able to use my remaining time to follow my passion to write, to have time just to be, to relax, to volunteer to help newcomers with their English. I wonder if I can plan my finances to enable me to continue my frugal lifestyle without having to work fulltime, but I’ve always been scared of anything financial. I’d love to win a copy of the book. I love Scott’s sense of humour as well as his values. I’m too doggone tired to increase my work hours at this stage in my life. I’ve recently been made redundant and am a single mum bringing up 4 children. His book would help me reduce my current debt, sustain what little income I get as well as help steer me financially in my new career path. At the age of 20 i started my first fashion design and wholesale business and would probably consider myself at the time as not very financial savvy… Im 23 now, and i would say im a bit more proactive now with my finance and investing, and still learning! This book would be a great help in maximizing my finance potential while im still young, as well as educating my fellow peers… i mean i just found out who Scott Pape is a few days ago! Our daughter and son in law are working in the Pilbara….earning big money but are in debt and not saving for the future. I have just sent them details of your program on Television. We think it’s great. My husband and I are both 65 and we are entitled to the Aged Pension. However, we want to be good investors of what money we have earned to this stage so any tips would be great.